Welsh Labour has suffered humiliation in the European elections, with the Conservatives topping the poll. It is the first time since 1918 Labour has failed to come first in a Welsh election, as its vote dropped by 12%. Labour, Conservatives and Plaid Cymru won a seat each, as did the United Kingdom Independence Party, which will send its first Welsh MEP to Brussels. First Minister Rhodri Morgan and Welsh Secretary Peter Hain said Labour fell victim to anger over MPs' expenses. 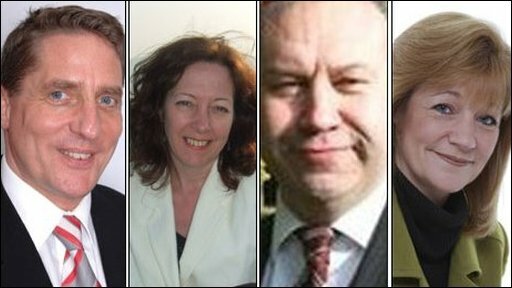 Wales' MEPs are Conservative Kay Swinburne, Labour's Derek Vaughan, Plaid Cymru's Jill Evans, and UKIP's John Bufton. Nick Bourne, who leads the Tories in the Welsh assembly said: "This result kills the lie that Wales will always be Labour." In 2004 Labour had won two of the four seats with 32% of the vote. But five years on Labour has seen its vote fall to just 20%. 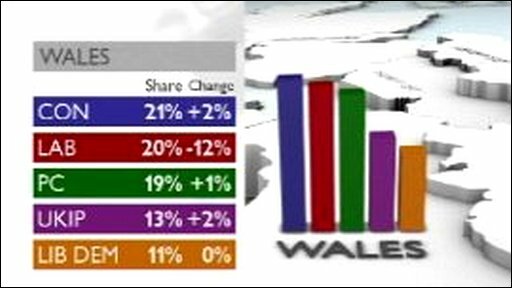 The Tories edged ahead of Labour, and were up 1.8% to 21%, while Plaid improved its share by 1.1% to 19%. But Liberal Democrats again suffered European disappointment. They have never had a Welsh MEP, and were pushed into fifth place, with 10.7%, up 0.2%. Before the results were officially declared, Labour's top two figures in Wales said Labour, as the party in power, had "caught the brunt of the public's anger". "This is a toxic combination when taken with the economic recession," said Mr Morgan and Mr Hain in a joint statement. "Low turnout has further reduced the Labour vote. "Above all, we have got to listen to the message that the public is so clearly giving us. "It is vital that Labour remains united and begins rebuilding trust. "Our task is to clearly convey the choice that Wales now faces: between a Labour government that believes in Welsh people and helps during hard times, and the very real danger of a government led by David Cameron that would savagely cut public services. Plaid Cymru MP Adam Price referred to an earthquake which hit south Wales on Friday night, adding: "We've had an even bigger one today. "It's off the Richter scale, because the Labour Party hasn't lost an election in Wales since the khaki election of 1918: you've got to go back that long. The Carmarthen East and Dinefwr MP said: "The political landscape has changed here. We've benefitted; we've had a good result, the Tories have had a very good result, but Labour... this is earth shattering for them". He said Labour was "imploding in the hardest of its heartlands". 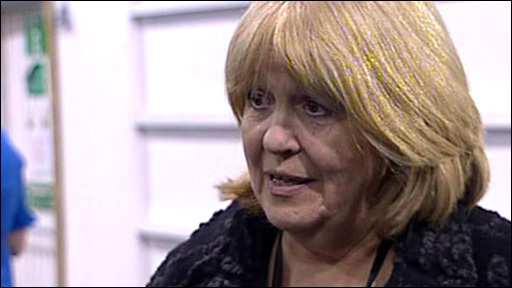 Earlier, retiring MEP and new Europe Minister Glenys Kinnock called it "a bad night for us". But she told the BBC: "We did very badly in the 2004 European election but then we went on to win the general election the following year. "If we go head to head with the Tories I still think we can turn things around." Mrs Kinnock said she was surprised to have been made a minister in Gordon Brown's reshuffle on Friday. But, asked about predecessor Caroline Flint's parting criticism of the prime minister, she denied that she had been brought in as "window dressing". She said she would not have a place in Cabinet in her new role and it was not something she was "bothered about". She said she was honoured to have been given the job and wanted to get down to communicating the importance of Europe to the UK. In 2004 Welsh Labour won 32.5% of the vote, Conservatives 19.4%, Plaid Cymru 17.4%, UKIP and the Liberal Democrats 10.5% each, Greens 3.6%, and BNP 3%. There was a turnout of 41.9%.